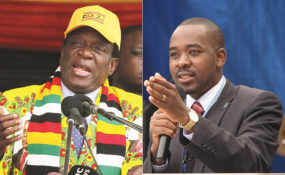 Nelson Chamisa's led Movement for Democratic Change (MDC) has called on President Emmerson Mnangagwa to urgently deal with legitimacy issues saying there is need for a national dialogue to end the current economic crisis facing the nation. Zimbabwe's economic situation seems to be crumbling amid worsening fuel crisis that has seen long queues at service stations and an increase in bread and cooking oil prices to the current $1.25 and $10 respectively. According to MDC National Spokesperson, Jacob Mafume, Mnangagwa must accept that he has failed and call for a national dialogue with Chamisa. "We restate that legitimacy issues must be dealt with urgently, the national dialogue must be done in respect of President Chamisa's suggestions political reforms must be prioritized to avoid future electoral problems and more importantly an urgent adoption of an economic recovery program in the form of the Zimbabwe Emergency Economic Rescue Program articulated in our SMART blueprint. "We therefore demand that Mnangagwa accept that he has failed, equally Mangudya, Ncube and the whole bunch must resign. The balance sheet of a stolen election is there for everyone to see," he said. Mafume said the ZANU PF manifesto was devoid of ideas and was only characterized by economic folktales and unrealistic dreams. "We affirm that the crisis has gone beyond Zanu PF's capacity to ameliorate the economic catastrophe. "Its manifesto was void on ideas, and was characterised by economic folktales, unrealistic dreams, archaic dirigiste methods and populist rhetoric sandwiched in slogans not backed by proper plans. "To make matters worse the man tasked with economic recovery is Mthuli Ncube a guy who had nothing to do with the writing of the dump manifesto. "Not only that, but that he is a person of questionable integrity who does little to bring credibility in the national leadership and clean the high country risk profile of Zimbabwe,"added Mafume.